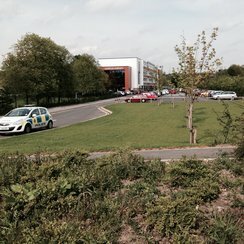 Police are investigating after a teacher was stabbed at a Leeds high school. At 11:48am today police were called to reports a member of staff had been stabbed at Corpus Christi Catholic College, in Neville Road in Leeds. The victim, known locally as 61 year old Ann Maguire, was taken to hospital for treatment but was pronounced dead. A 15 year old male pupil has been arrested in connection with the incident and is currently in custody. Detective Superintendent Simon Beldon, from West Yorkshire Police Protective Services (Crime), said: "We would like to reassure people that this has been an isolated incident and there is no ongoing risk to pupils or staff at the school. "The rest of the school is continuing to operate as normal and we would ask that parents do not attend the site unless directly requested to do so by the school. Samuel Dasaolu was a pupil at the school until 2011 and paid tribute to the teacher, who taught him Spanish and Religious Education. He said: "I felt like she was almost a mother figure of the school. I felt I could go and talk to her. She made everybody feel so comfortable." The 18-year-old said he never heard about pupils carrying weapons when he was at the school. "I can't get my head around the fact that somebody would do that. Everybody loved her and respected her," he said. Downing Street described the stabbing as "appalling". 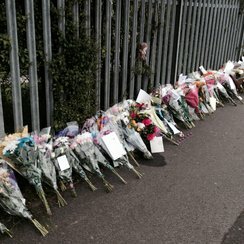 "The Prime Minister's thoughts are very much with the victim's relatives as well as the entire school community there, which I'm sure will be deeply shocked,"the Prime Minister's official spokesman said. Corpus Christi College in Leeds, where 61 year old Ann Maguire was stabbed.